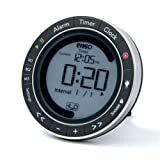 A thoughtful gift for people with a meditation or yoga practice, the versatile Enso Clock can be programmed with up to 99 sequential timers. The countdown timer features a visual onscreen circle, and the alarm uses soothing chimes of Tibetan singing bowls. 3″ diameter; 0.8″ thick. Made in China. Enso, which means circle in Japanese, symbolizes enlightenment, elegance, and the universe. Traditionally, the enso is painted with a single clockwise brushstroke, beginning and ending at the bottom. The central deplay feature of the Enso Clock is the painted circle that surrounds the screen and is gradually brushed onscreen as the timer progresses. This way, the user can glance at the Enso and see the relative amount of time that has elapsed, eliminating the distraction of focusing on the exact numerical time that remains. This entry was posted in Meditation and tagged Clock, Enso, Meditation, Salubrion, Timer. Bookmark the permalink. Excellent features and sound of chime. Much more useful and versatile than any other meditation timer that we evaluated. Lovely, secure travel bag comes with it. Absolutely worth the money. It’s been a month and a half and i still have not gotten this product. The seller has not been responsive (e.g. no answer to voice mails, no followup calls after they say they are going to followup). I’m turning things over to my credit card company and the BBB. Good luck for the rest of you all. I’ve been using this clock/timer for nearly two years to support my daily meditation and yoga practice. It’s okay, but not great. What’s good: I like the look and feel of the clock/timer. The numbers are about an inch tall, so it’s easy to read. The back is made of hard rubber, so it’s easy to pick up and hold, especially with sweaty yoga hands. I like the little padded zipper case it comes in, although I don’t travel with it. The audio tones are nice. There is a deep chime, a brighter chime, some wood blocks, and a more traditional alarm-clock beep. What’s not so good: The overall functionality and ease of use of this rather pricey–$99–product are very poor. The icons on the control buttons are not particularly intuitive. The clock is easy enough to set, but beyond that, you’re in Frustration-ville. I’ve been using this thing every day for a couple of years, and every time I need to set up timed intervals, I have to get out the instructions. Which brings me to another quibble: you have to change the batteries–2 AAAs–about 4 times a year. That seems like a lot. Also, you lose all your painstakingly entered intervals every time you have to change the batteries. Argh. There is a low-battery indicator, but the only time I’ve ever seen it is about 30 seconds before the screen goes blank. Not particularly helpful. The instructions and the expanded online documentation (that you need to download an 18-page tutorial to use this thing says a lot) say that you can set the audio to sound continuously or twice, which I’ve found to be misleading. That might apply to the alarm function, which admittedly I don’t use, but if you’re using the countdown timer or timed interval function, the chime sounds only once at the end. Finally, as other reviewers have noted, you cannot set timed intervals in seconds (say, 45 seconds). Seems as though this function should be available, as the final minute of a timed interval counts down in seconds. When this breaks, I will buy something else to replace it. Just received my Enso Timer. I purchased it for meditation. The good: the chime is lovely and perfect for ending a session. The (very) bad: the backlight flashes right before the chime starts. Based on the prior reviews, this is a new “feature”. It does not seem to be optional. Since I usually meditate at night, in the dark, the backlight ends up startling me out of the meditation. This mitigates the efficacy of the chime sound, which is the primary reason I purchased the device. Ironically, the backlight is pretty much useless when setting up a session, as it only stays on for 2 seconds, and does not illuminate the buttons in any case. I love using the timer for mediatation, and it’s nice to wake in the morning to a gentle gong. My only quible is the price – $100 is a lot for a plastic timer/clock, even with all the nice electronic features. But mine was a gift, and as such is greatly appreciated.